Chinese Premier Wen Jiabao urged Chinese law students to be fair-minded and patriotic in future law enforcement here on Sunday. A law student should develop a high degree of sense of responsibility for the country, the society and the people. He or she should be fair-minded and above all, love this country, said Wen during his visit to the China University of Political Science and Law on China's Youth Day. During his trip, Wen first went to the first floor of the university's library, which boasts the country's largest collection of modern law books. Here Wen met senior experts and professors and talked with them about the law history. "We will better implement the policy of 'administration according to Law'", said Wen, when receiving a collection of law history books from professor Zhang Jinfan, who spent 19 years with some 10 professors to compile these books. Wen then stepped into the second floor of the library, where he joined the students in the reading room and exchanged views on legal system building. To promote democracy, improve the legal system, and rule the country by law is not only a national strategy, but also serves to safeguard the personal rights and freedom of every citizen, he said. When asked to comment on the link between people's livelihood and the concept of "Ruling the Country by Law", the Premier said that only when policies addressing issues of people's livelihood were stipulated into law, could people enjoy the benefits of these policies for a long term. Wen then walked into the dormitories and chatted with the students. "I learnt things that are not taught in classrooms. The Premier knows so much about law and puts such strong emphasis on law, I will study hard and make my contributions to the country," said postgraduate Chen Xuemeng. 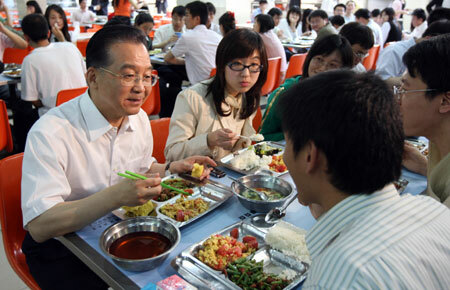 Around 12 o'clock, Wen walked into the school's cafeteria and had lunch with the students. The Premier expressed his concern over the recent price rise, and asked the students if they could afford the daily food and whether the scholarship could help them solve their difficulties. To make sure that the college students' living standards are not influenced by the price rise, the government has allocated 20 yuan of subsidy per month for each college student, with those from very poor families receiving 40 yuan each per month, Wen said. At 12:30, the premier left the campus as large crowds of students waved goodbye. "The Premier's visit makes this Youth Day special and meaningful," said student Yang Kunzhang, "The premier's expectations direct the way of our future efforts".